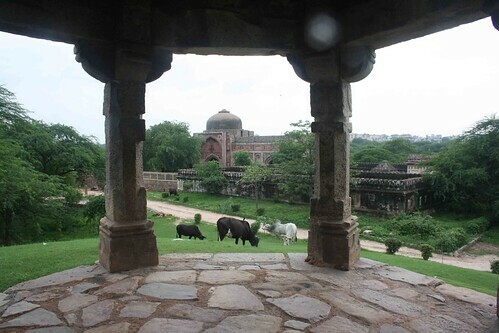 One dreamy ruin that you must visit when in love is the Metcalfe’s Folly in Mehrauli Archaeological Park, that deliciously dense jumble of trees, graves, and domes in south Delhi. 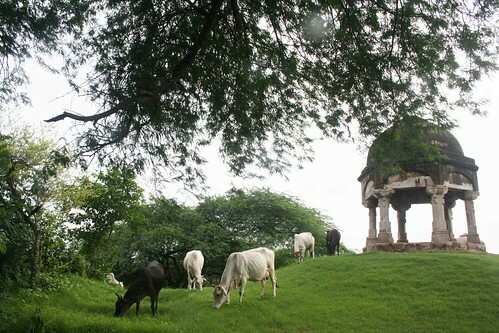 On the peak of a grassy mound stands a stone canopy built in 1850s by Charles Metcalfe, an Indophile British, as a ‘folly’. The folly was a very British thing, a new building meant to look like old and to be viewed in a picturesque landscape. In itself, Metcalfe’s hexagonal structure is unremarkable. 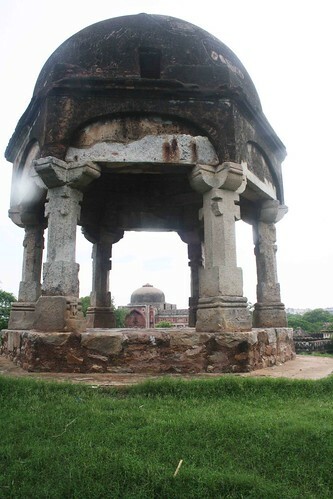 The columns are minimally carved; the semi-circular arches are not ornamental, the surface is cobbled. 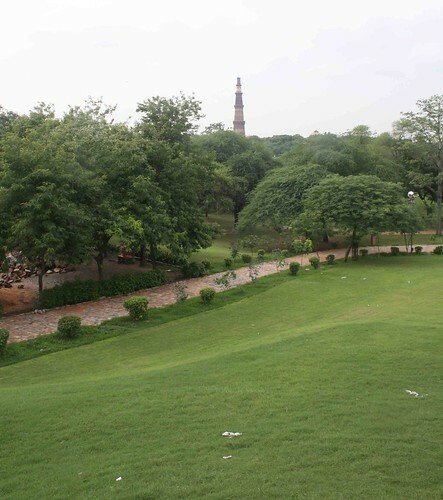 It is the folly’s lighthouse setting — commanding a view of the towering Qutub Minar, the lovely Jamai Kamali mosque and the rolling greenscape — that soak your senses with overwhelming passions. The afternoon hours are the best time to visit the folly, especially if you are planning a date. Then the few people who are around have come to seek solitude and so won’t bother you. 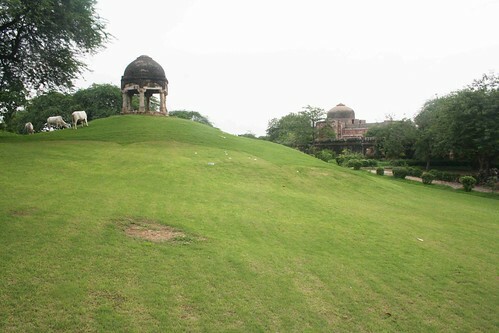 There is an orange-coloured bench just below the folly, and unknown tombs towards the Jama Kamali mosque on which squirrels play their catch-me-if-you-can game. 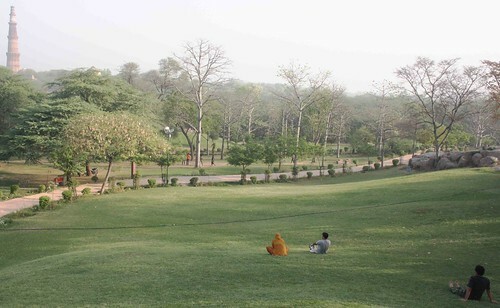 The most inviting is the slope’s trimmed grass. You may be tempted to lie down and kiss your lover’s lips, or continue with the unreadable Marcel Proust or listen to Kishore Kumar songs on your iPod. One charm of urban havens, which a jungle resort lacks, is to experience the petrol-powered din of a city being tuned into a comforting hum. Metcalfe’s Folly looks to the wild but the continuous roar of the flying planes make it clear that an airport is nearby. The highway is a stone’s throw away. Don’t despair. The rumble of a DTC bus has a place here as vital as that of bird sounds. 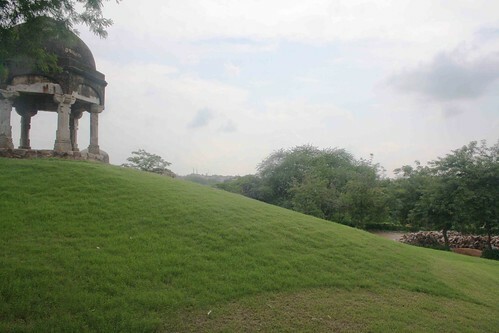 After emerging out of Metcalfe’s Folly into Mehrauli-Gurgaon highway, you will love the city more. Promise. Loved the pictures, Mayank. 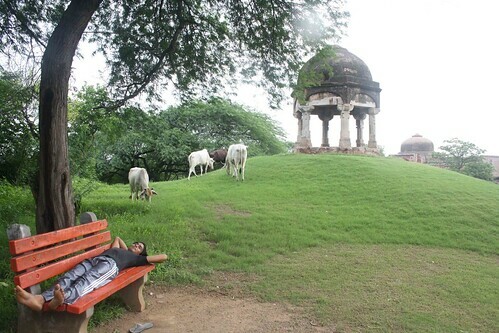 Reminds me of my school picnic days, somehow! I used to go to Metcalfe’s canopy and roll down the slope ,as a child. It used to soil my clothes but it was a lot of fun! 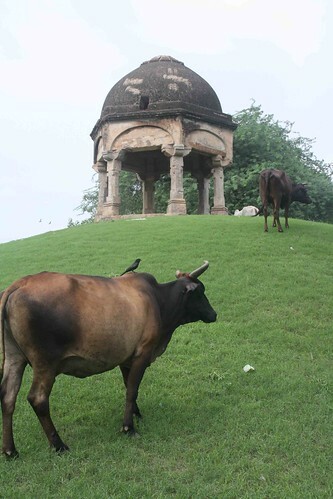 I visited Metcalfe’s Dilkusha in the Mehrauli archaeological park a few months back. 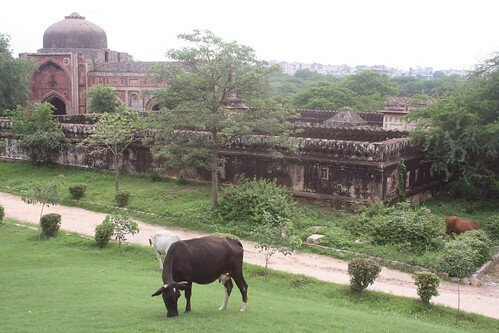 I sat in the ruins and read sections on Dilkusha from Emily Metcalfe’s The Golden Calm. It was a strange experience – imagining what Metcalfe’s weekend getaway would have been like, as described by his daughter, more than 150 years ago. PS: Congratulations on the new site. Looks great and so much better than the earlier one. Would be great if you could also add a search button. ur pics r really awsome mayank……..nd will love to see some more of them and writting too also all abt jane austen nd arundati roy…………………….